Nigeria’s President, Muhammadu Buhari, has called on world leaders to forge a united front to save Lake Chad’s ecosystem from further depletion caused by the adverse effects of climate change. 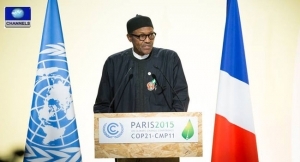 The Nigerian President made the request at the Leaders Event of the United Nations Climate Change Conference, commonly referred to as COP 21, in Paris. President Buhari said climate change had continued to pose a threat to Nigeria’s security and development. He said: “At the sub-regional level, we are saddled with the challenge of the drying up of the Lake Chad Basin, which is resulting in the total wipe out of livelihoods of many communities surrounding this trans-boundary natural resource. “The Government of Nigeria welcomes the Lake Chad Development and Climate Resilience Plan, and the Lake Chad Basin Commission and international partners for designing this climate-based Plan”. “In all, the experience of countries sharing the Lake Chad further illustrates the mutual challenge we face today and which must be collectively addressed without further delay”. On Nigeria’s position on the climate change negotiations, President Buhari said any meaningful and potential agreement on climate change in Paris, “must draw extensively on the principles of common but differentiated responsibilities and respective capabilities”. The President, who shortly before his arrival to Paris approved Nigeria’s Intended National Determined Contributions (INDC) to tackle climate change, said for any agreement in Paris to be durable, “it must recognise not only the emission right but also the survival rights of the citizens of developing countries”. According to a statement by the President’s spokesman, Femi Adesina, Buhari said the potential agreement must make provisions for adequate financing, technology transfer and capacity development in the developing countries. President Buhari therefore called for the establishment of an effective means of monitoring, reviewing and verification of availability as well as accessibility of funds to the developing countries in order to address the challenges of climate change.